The Third Amendment "No soldier shall, in time of peace be quartered in any house, without the consent of the Owner, nor in time of war, but in a manner prescribed by law." The Fourth Amendment "The right of the people to be secure in their persons, houses, papers, and effects, against unreasonable searches and seizures, shall not be violated, and no Warrants shall issue, but upon probable cause, supported by Oath or affirmation, and particularly describing the place to be searched, and the persons or things to be seized." We no longer worry about the government forcing us to house soldiers, and we accept that search warrants are not issued without probable cause. But the Third Amendment addressed the Founders' underlying fear of creating a standing army, seeing it as a potential threat to democracy, and the Fourth Amendment attempted to restrict broad, non-specific searches. As the world's supreme military power, we obviously overcame the fear of a standing army, and the Supreme Court has created so many exceptions to the latter that the original intent has been hollowed out. The original intent, the later history and interpretation of the Third and Fourth Amendments, from 1791 to today, is recounted here. Writing for the interested citizen, as well as the civics student, Robert McWhirter traces the histories with which the Founders were familiar, recounts their recent experience as a colony, and how each informed their thinking and drafting. On the journey there are surprising, and interesting, discursions into the way the events and personalities surrounding these Amendments have appeared in literature, film, sports, and popular culture. 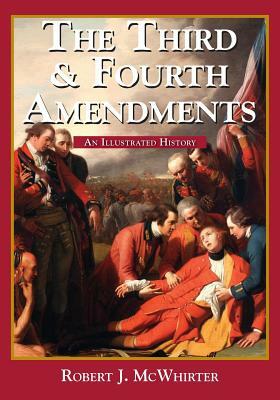 The book is part of a collection chronicling the origins, history, and interpretation, of the first ten Amendments to the Constitution - the Bill of Rights.